I got mail from the American Congress of Obstetricians and Gynecologists (ACOG) today. I get a lot of mail from them. Together we are responsible for much deforestation. For example, I would be happy NOT to get a print version of the Green Journal as they promptly go into a pile from whence they will never return. I read the articles I want on line. Today’s mail was different. A puffy package with the bubble wrap. A press package. 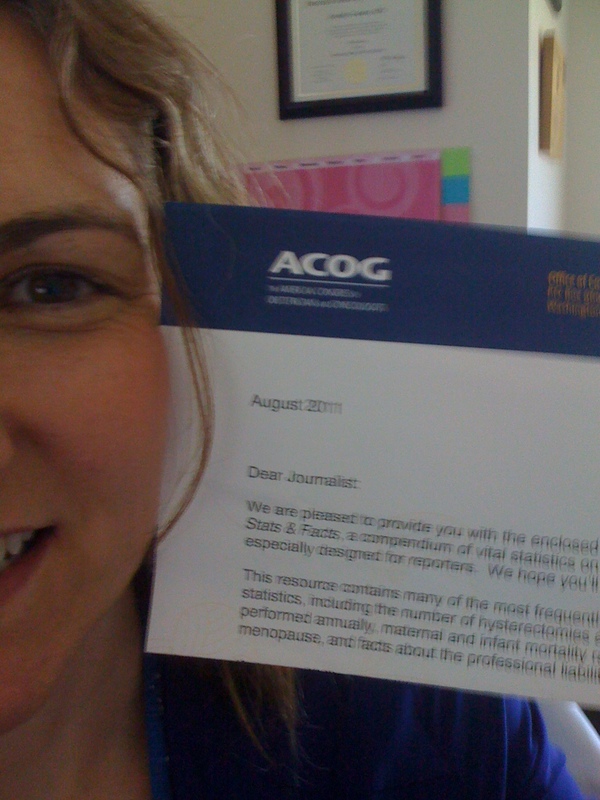 Yes, that’s right, according to ACOG I am now a journalist (see the Dear Journalist picture for proof). The press package had a nifty little book with 2011 stats and facts for women’s health. I flipped through it and was stunned at the malpractice information. We talk about the ever increasing rate of c-sections (31% of deliveries!!!) and all the different reason why this happens. Tort reform is always tossed around, but no one ever seems to do anything about it (maybe because Washington is run by, I don’t know, LAWYERS?). So here are the sad stats. Truly, I was blown away. 30.5% of obstetrics claims involve a neurologically impaired infant and 49% of these claims are lost (meaning money was paid). FYI, losing a claim does not necessarily mean anything was done incorrectly. In 2009 in 17 states liability premiums for OB/GYNs were more than $100,000 a year. In one state OB/GYNs pay > $200,000/year for malpractice insurance. I have blogged before about how lawyers impact the c-section rate. How great men like *cough* honest John Edwards have made hundreds of millions of dollars from obsterics lawsuits. I don’t know how to fix this. I don’t. But it needs to be fixed. Lawyers are changing the practice of medicine, and it’s wrong. How do we fix it? Educating women on what biologically normal birth really looks like. Stop indoctrinating women into the idea that birth is a medical crisis waiting to happen. Demand access to (and coverage for) trained doulas and midwives. Start making midwives and OBs a continuum of care, not a rivalry. thank you. Really great reply. a biologically normal birth looks like maternal death in 1-1.5% of all pregnancies, and many more poor fetal or neonatal outcomes. No, the maternal death rate with a vaginal delivery is not 1-1.5%. I think GH meant “normal” as in “in nature, without docs or technology”. THIS is what many NCB advocates talk about when they bag the drum of “normal”- not a VB, but a VB with zero tech, meds, etc. Why would I want a midwife when I can have an OB? YOU might like MWs, but many moms don’t want them. They aren’t any more likely to make you deliver VB than not, it just seems that way because they are limited to low risk moms! I’m tired of hearing that docs don’t see, or understand “normal” birth. Maybe it’s the natural childbirth advocates that really don’t get it. YES. I roll my eyes every time I hear someone say that OBs “don’t see” normal births. Anyone making that statement clearly has no clue what an obstetric residency entails. And the irony is that it’s the NCB advocates who haven’t seen or even read about all of the things that can and do go wrong. Holy crap… I’ve known for a while that c-section rates were influenced by fear of litigation, but this is the first time I’ve seen numbers with direct links like this. It’s just scary…. Thanks for sharing. It’s a long time since the original post, but here’s another perspective. In my country (Slovakia), the rate of C-sections is up to 38% (March 2012), BUT doctor litigation is nearly unheard of. People see courts as ineffective against any personal injury and may go other routes (administrative complaints), but I have not heard of a single case when an OB/GYN was successfully sued for money. Another reason being, of course, that a majority of births take place in (state-owned) hospitals, so you’d basically have to go against the state. The driving factor behind the high rate of C-sections is probably the women themselves. The assumptions are that they give birth at a higher age and so want to increase the chance that their (probably only) baby will be healthy; that they are afraid of the pain; and fear the risks associated with natural assisted birth, etc. I know second hand, my wife gave birth by C-section because she assumed from the very start that she would have a “medical condition” for it. If you wish it hard enough, it becomes truth, especially when doctors are sympathetic. I would have much rather tried it the natural way, but since I was not the one giving birth I backed down. I would not be surprised if this was the same case with many other women. Sometimes I think that the struggle for perfection is crippling our society – we want everything to be perfect, but it just costs so much energy. YES. Here are the real reasons for the “high” c-section rate in the U.S.
Dr. Jen, great article. This is a poster for defensive medicine that is more than just a monetary cost. There’s no easy solution – though I have proposed a complete change in how the issue of malpractice is dealt with. I’m curious about Kaiser’s c-section rates, since Docs are shielded more from the lawsuits. Does a relative degree of malpractice protection affect rates? Hi, I’ve only just found your blog and this post, it’s very interesting how different things are in the US to here in the UK. 26% of obs won’t offer VBAC ! In the UK VBAC is very strongly pushed (excuse the pun) by most Obs and midwives (most people will see far more of midwives than doctors). After an emergency C-section I was told I’d be expected to try VBAC if I have another and would have to argue my case for an elective CS with the departments Psychiatrist on mental health grounds if I really wanted to go down that route. I blogged about this recently and was speculating just today if the difference in opinion in the US v UK had anything to do with higher litigation rates in the US – I’ll link to this post! The precipitious rise in c-sections started when John Edwards “channelled” the voice of a dead baby in a courtroom and won millions by his inference that IF ONLY the doctor had done a c-section, the baby would have survived. A glut of “bad birth” suits followed, and doctors started to do more c-sections because they were terrified at the prospect of sitting in a witness chair and having a smug plaintiff’s attorney demand to know “WHY didn’t you do a c-section, Doctor?” while blaming physician negligence on every celebral palsy incidence in the nation. Sadly, although the rate of c-sections is now up to 31% from the 5% it was when these types of suits became “popular,” there has not been a SINGLE PERCENTAGE POINT decrease in the number of celebral palsy births. Why? Because the causes of cerebral palsy aren’t connected (in most cases) to the circumstances of birth. Yet late-night TV ads still promise people lots of money if there’s anything wrong with their children and doctors continue to perform more and more c-sections. LAWYERS have put pregnant women at additional risk in this country, and whenever anyone makes noise about the infant mortality rate or maternal distress, much of the blame lands squarely on lots of people who didn’t go to medical school, and make their fortunes preying on those who did. Couldn’t agree more. I actually wrote a post about Edwards and how I hoped there was a pregnant woman who wanted a VBAC on his jury! In response to this article and to many of the comments following it, here’s a real explanation for the increase in c-section rates, backed with about 23 legitimate scientific sources.